For the U.S. this weekend we have Memorial Day to recognize all our armed forces who died serving our country. There is some confusion here in the U.S. as November 11 is our Veterans Day, honoring all who have served in our military. Memorial Day was strictly intended to remember those who gave their lives in the military, not our current military, nor its veterans. 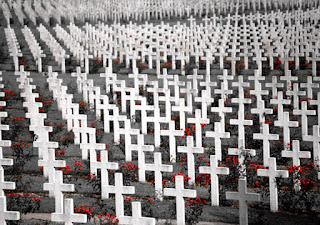 For both the U.S., the British Commonwealth, and even many non-Commonwealth nations, poppies are a visual symbol pointing back to a poem, "In Flanders Fields", by Canadian doctor, Lieutenant Colonel John McCrae, in the spring of 1915, shortly after attending the funeral of a friend in Ypres and seeing poppies growing in battle-scarred fields where the soldiers had been buried. After the First World War, the poppy was adopted as a symbol of Remembrance and their bright red color reminds people of all the blood shed. I was told at the time of the poem it was one of the only things able to bloom in the cemetery there. The flower is a perfect example of why wildflowers should never be called weeds. 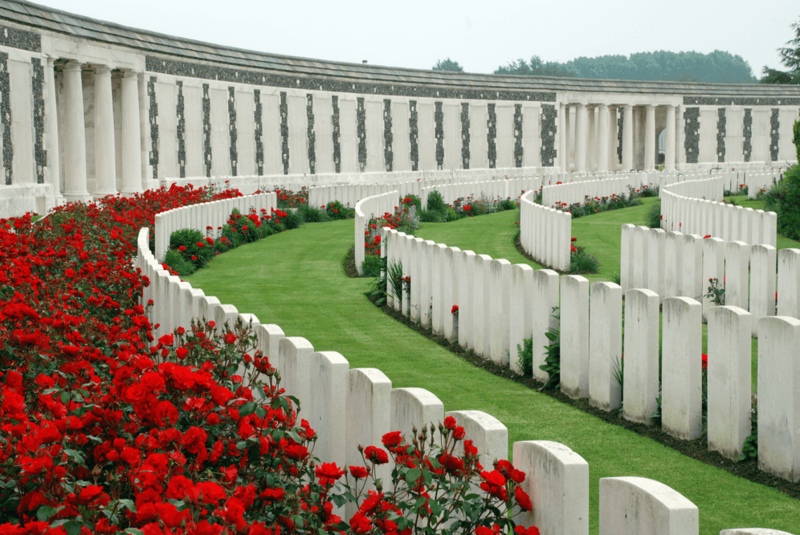 Wikipedia, in an article about it under its scientific name of Papaver rhoeas says, "Due to the extent of ground disturbance in warfare during World War I, corn poppies bloomed in between the trench lines and no man's lands on the Western front." I was even told lime was used for those graves, so that further eliminated most things from growing there. In that same article about the flower, Wikipedia states, "Before the advent of herbicides, P. rhoeas sometimes was abundant in agricultural fields." 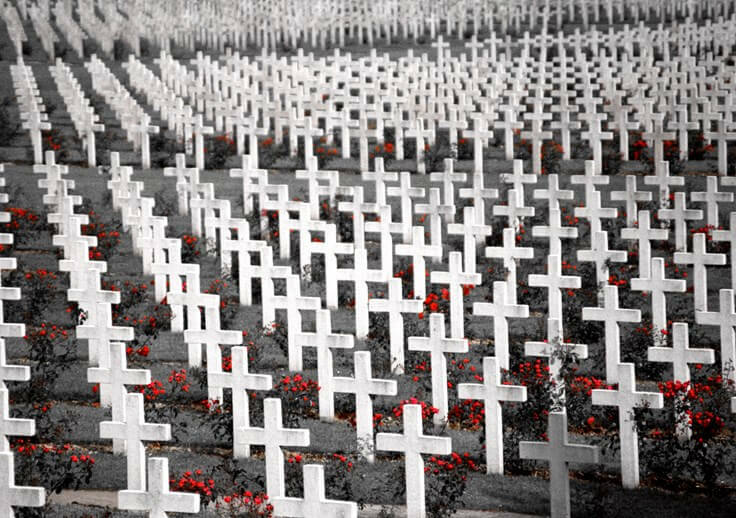 The picture at the opening of today's article shows the cemetery has changed from the days of preliminary crosses and wildflowers finding their way onto the grounds where so much blood was shed. The flowers and tombstones look too cultivated to be what was seen in the early Twentieth Century. I am encouraged that the European Union has banned the use of neonicotinoid pesticides because they have proven it has killed bees, butterflies and, more recently, declining bird populations also are being linked to the pesticides. Pollinators like these are crucial to our own survival because they are needed for our agriculture and food production. Here's a link to a petition to our own Environmental Protection Agency asking that they, too, ban this war on our own pollinators. The underlining of the word "Protection" is my own, since that is supposed to be what the agency does. Both Memorial Day and flowers remind me of that song about "Where Have All the Flowers Gone" and how it ends with the repeated phrase "When will they ever learn?" Personally I wish Memorial Day, wonderful as it always is to have a three day holiday, had stayed on May 30 because moving it to the last Monday in May has changed it to what people now call "the unofficial start of summer." It was meant to be more than that. Speaking of summer starting unoffically, here in Michigan's version of the Great Lakes' version of Lake Woebegone we barely gave a nod to springtime before summer arrived with 90 degrees! As for World War I itself, I keep remembering the commonly used statement "Those who don't remember history are doomed to repeat it." My program with me portraying Oleda tries to honor her, our veterans, and Women's History. I sincerely hope it continues after November 11, 2018 as its message is not just about that "eleventh hour" or even Flanders Field.